I might be addicted to faux finishes. Anyway, back to my “alleged” addiction. To make myself feel like I’d accomplished something on my holiday (way back in June if you recall) I tore apart the downstairs living room. Sometimes called the X-Box room despite my efforts to call it My Studio. I wanted a place where I could go to be creative, where I felt invited to sing my songs, tap dance, write. Its state at the time of demolition could be summarized as ‘gross’ and gross is really not the invitation to creativity I was looking for. It’s taking some time to put it back together again. I have no before pictures because it was the era of the Gollum stolen battery charger and really the room was as I said gross and I don’t want to sully my bjournal with its memory. The ugly wood panel surround at the ceiling level (constructed I believe to hide pipes and wiring) has been painted yellow. I might start gluing old postcards and ticket stubs to this. Or glue a zig-zag ribbon around so I can stick postcards and stuff underneath the ribbon. I haven’t decided yet. 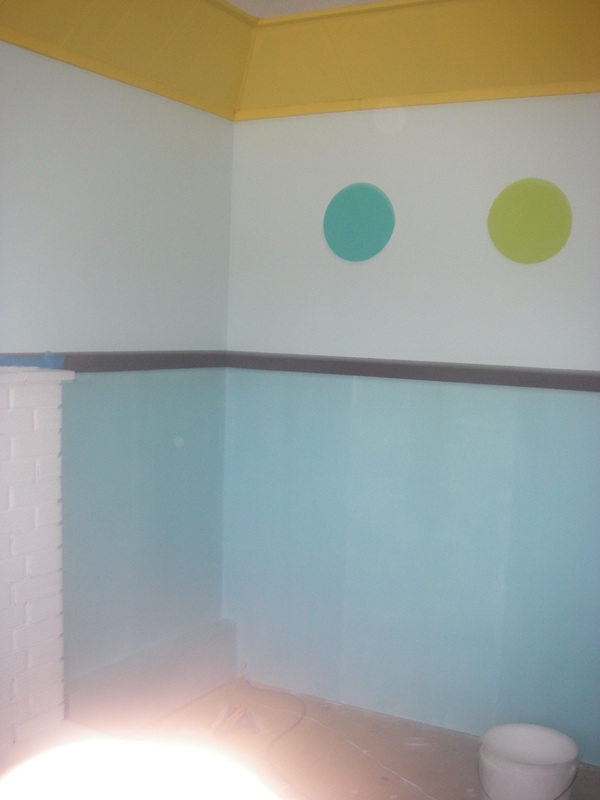 The walls were primed, painted a robin’s egg blue, then the bottom half painted with a darker blue that then had a linen faux finish applied to it. 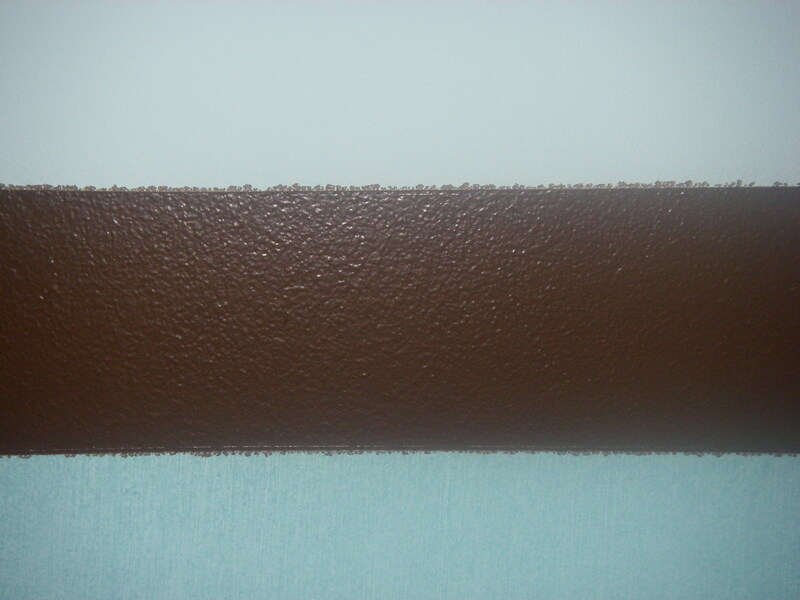 A chocolate brown stripe separates the two halves. (Although I’m not quite sure if it’s a good idea to have the suggestion of chocolate surrounding me). In doing, the faux linen finish I’ve discovered a few things. Read the instructions chief among them. Contrary to my initial attempt, you really do need to 1) tape off sections, 2) put a lot of glaze into your paint, 3) use a large roller to get the paint on 4) use the proper Ralph Lauren linen finish brush (even though it’s criminally expensive: $27), and 5) don’t make your sections too big otherwise the paint dries before you can get your lines in. Yes, I did EVERYTHING wrong in my first botched attempt, which meant I abandoned the whole project for 2 weeks while I nursed my wounded pride. I have to fix the brown line because it bled all the way around the room. Short of buying $100 worth of finishing wood, I’m going to spend $4.00 on tape and paint over the bleed. Should be fun. Update: I actually did this, and the results are not perfect (particularly on the underside) but they are satisfactory. 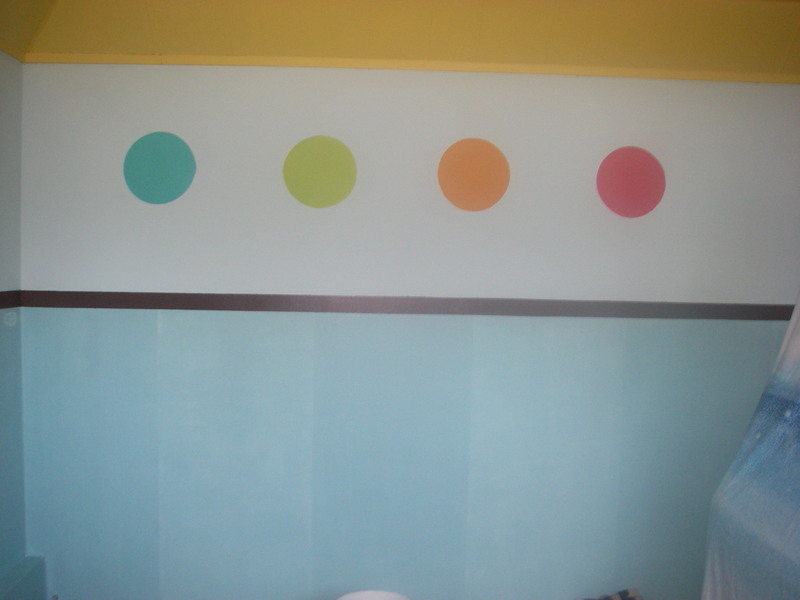 On one wall I painted 4 circles, each of a different bright colour. I’m pretty pleased with the results. 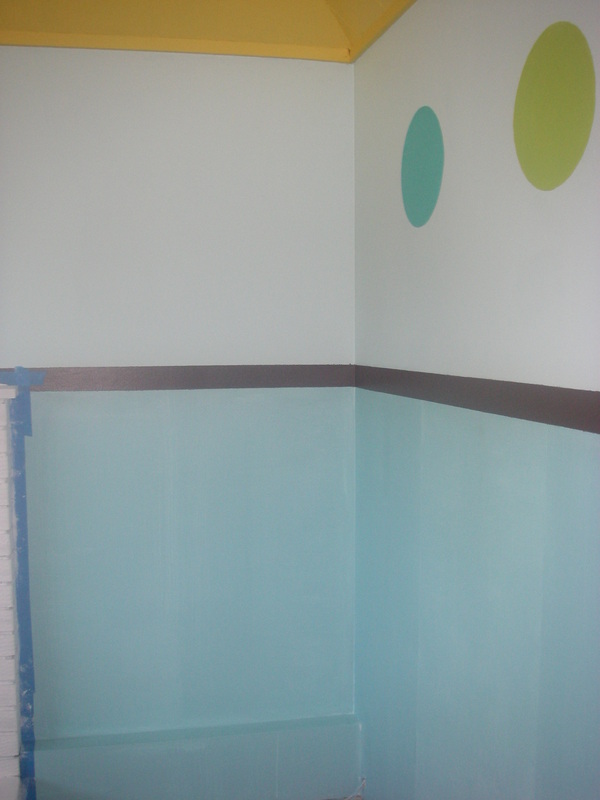 I used the sample bottles from the Debbie Travis collection, so total cost for that paint was $30. 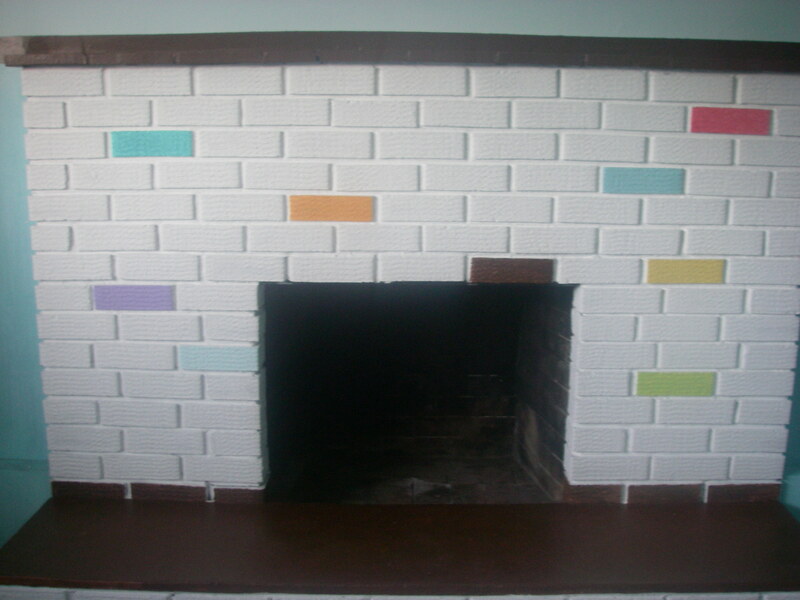 I primed the fireplace a nice bright white and then painted a few odd bricks the same colours from around the room. I’m really pleased with how this turned out. 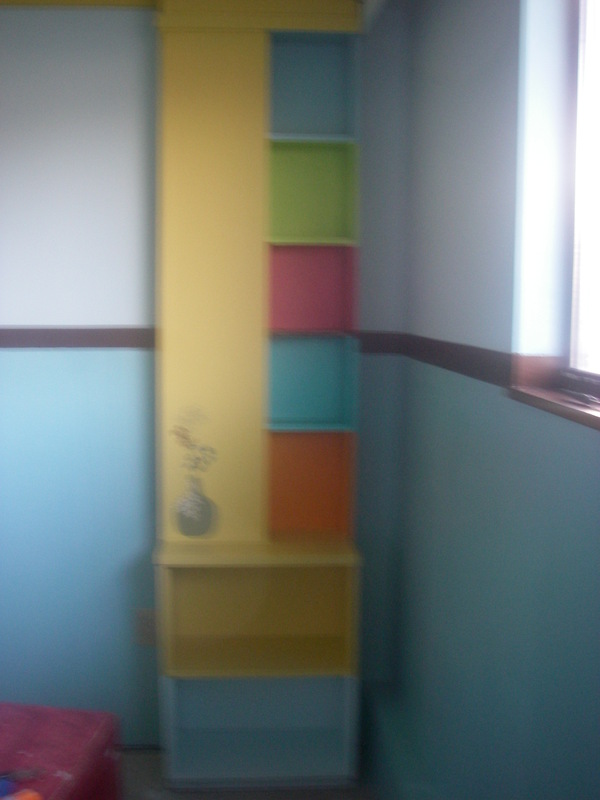 I painted the shelving unit (also I believe constructed to hide heating pipes etc. 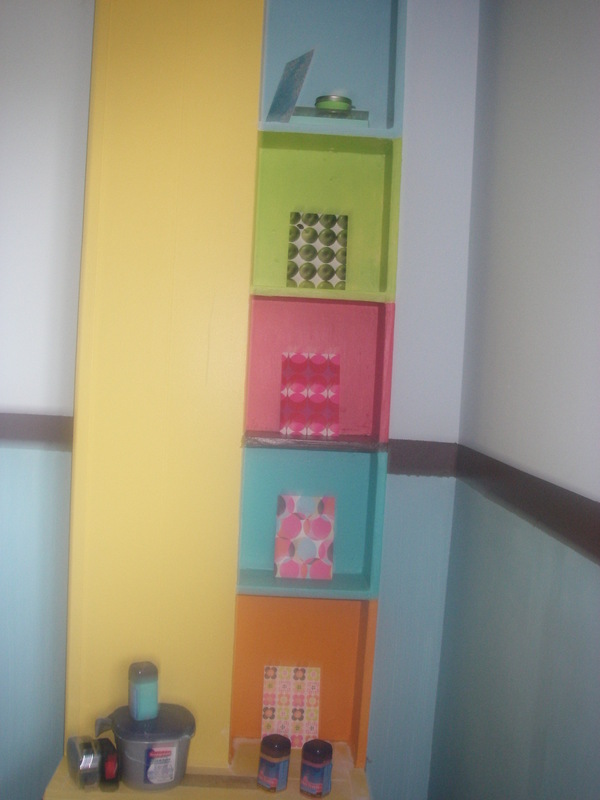 I used mainly the same yellow as the edging but the shelves got the individual colour treatment. I then added a postcard (purchased for .10 each at the clearance bin at Chapters) to the back of each shelf. Ooh, and here’s my favourite under $4 craft project. I needed to cover the wiring panel. 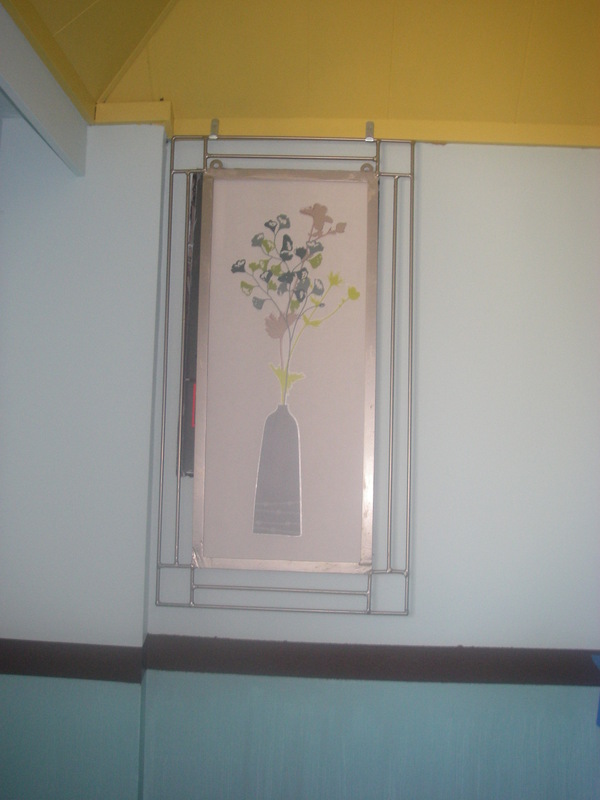 I had a frame of roughly the right size which I got from a leftover piece from my brother who used to make steel furniture and accessories. I found at the dollar store a set of two decals. 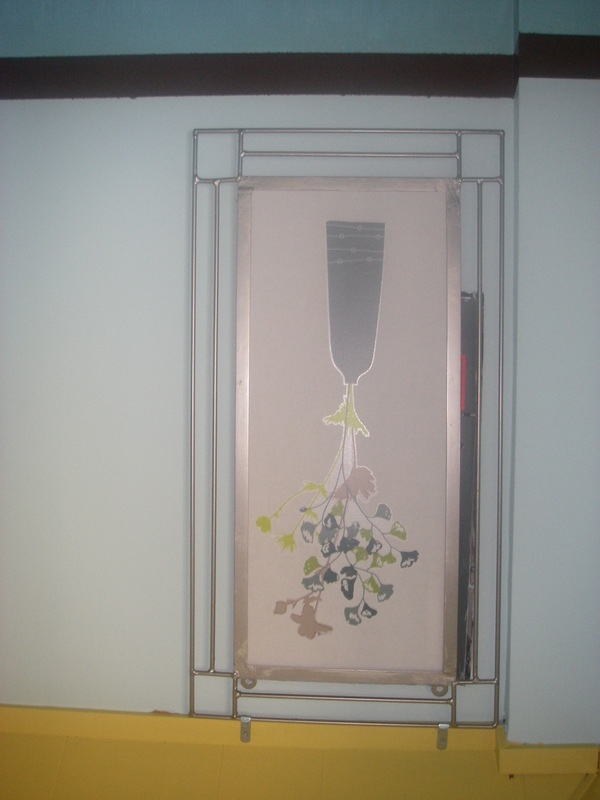 I used the cardboard from the package the the decals came in, placed the taller of the two on the cardboard, affixed it to the frame and then used mirror hangers to attach the frame to the wood edging just below the ceiling level. It’s gorgeous! And you can access the box by just lifting the frame or taking it right off the hangers. I used the other decal on the shelving unit. 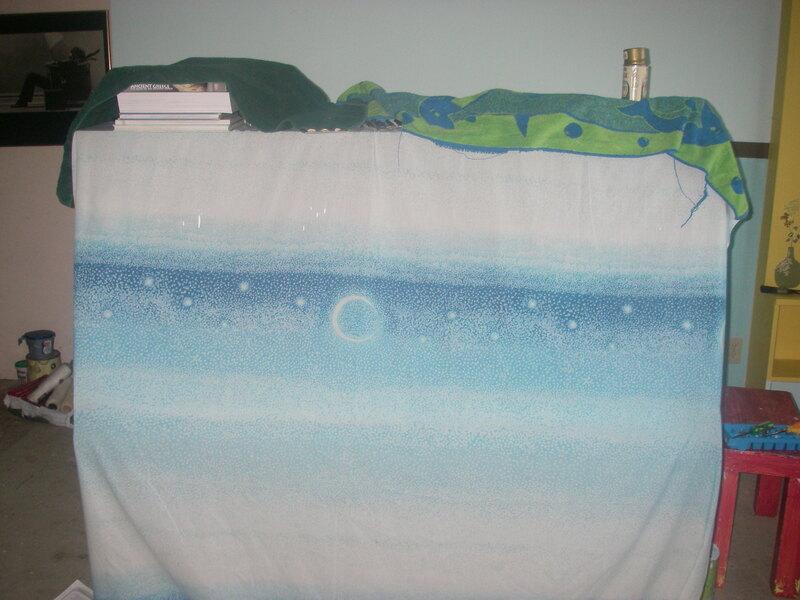 I’ve included photos of the ceiling fan and the piano (under its piano cosy / repurposed duvet cover) to relay the following story: I used my laser pointer (my first time!) to line up the circles, but as I did not have a tripod I perched the laser atop the piano. I then stood on the piano bench to assess the level marker on the laser level, when suddenly I became aware of a whoosh, whoosh, whoosh sound next to my ear. 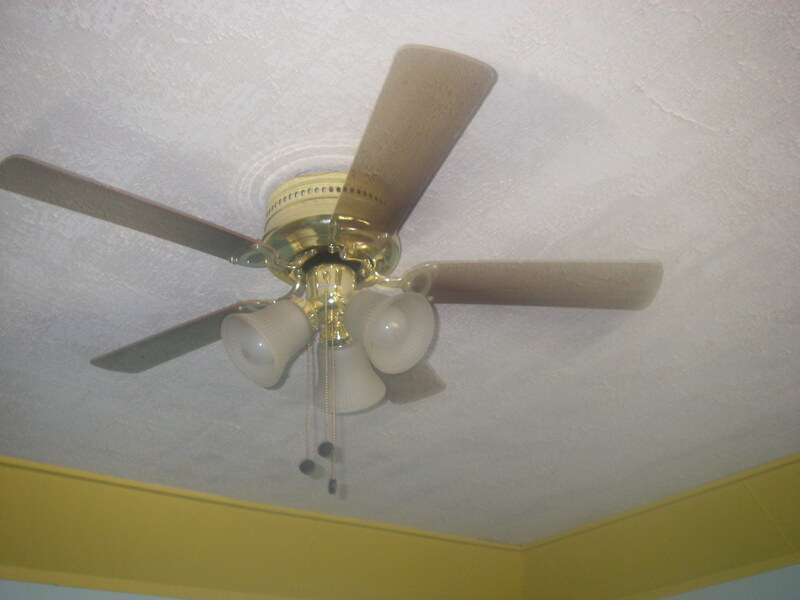 It was at this moment I realized that I was almost standing up right into the ceiling fan. Glad I didn’t have to explain that injury at Emergency. Seeking vinyl peel and stick tiles (VPST) for lonely concrete. 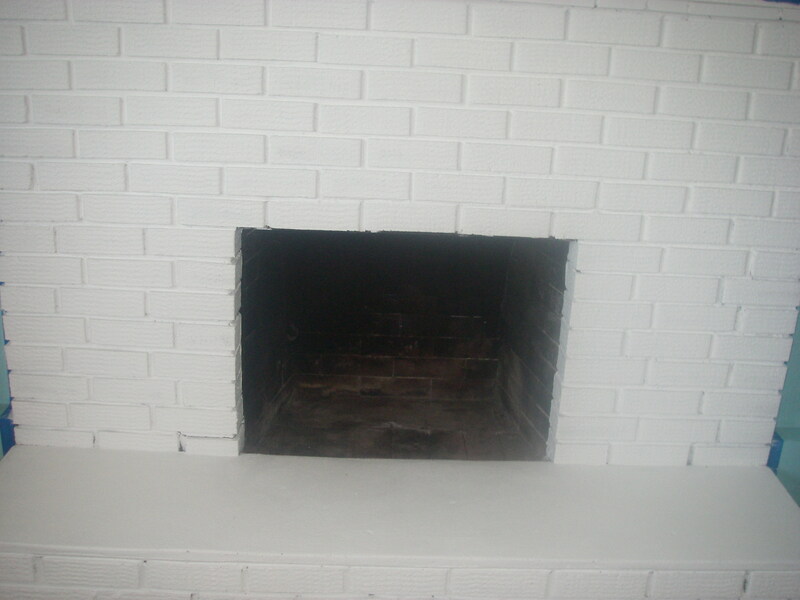 Please see photo to see if you would be a good match for the ceiling and walls. If you’re colourful, creative, beachy and have inexpensive tastes (or like to get laid for free) I’d like to hear from you. I promise a level floor, much love and tap dancing. So, I guess that means you’ve also got to be a little thick-skinned because everyone knows you gotta be able to take a little beating in the cause of creativity. We’ll learn together. How this can come to me. It could appear on my doorstep, as long as I still get veto power if I don’t think it’s suitable. Someone could point me in the direction of a store or an internet listing. I’m open to all possibilities. It’s a 200-square foot room. And let me mention if I wasn’t clear before–cheap or free. Seeking couch for early morning trysts with the muse. Sleek, clean lines, but comfy. I keep seeing purple in my mind, with silver legs. I would also love it if you could be a little flexible and be a bed sometimes for kidlet sleepovers. Futons need not apply. Here’s to clearing the path to creativity! This entry was posted in Rainbows, summer solstice and tagged creativity, home decor. Bookmark the permalink.